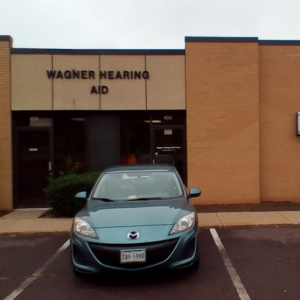 Office Manager is Bruce Wagner, CCC-Audiologist and Hearing Instrument Specialist. The Culpeper office was opened in 1978 as a subsidiary of our main office in Charlottesville. On days that the Culpeper office is not open, phone calls are automatically forwarded. The Culpeper office can be very busy at times, therefore an appointment is preferred. Directions: Our office is on Business Route 29 (767 Madison Road) east of town in the Culpeper Office Park near the Bypass. Coming in to town from the Bypass, go past the Best Western (formerly Holiday Inn), the 7-Eleven and Pelham Used Cars. The next building on the right is Culpeper Office Park which is a cream color brick. Turn Right on Southridge Parkway and immediately turn Right again into the parking lot. The first office is Dr. Brooks Chiropractic. Our office is the next one. Coming in to town from Culpeper on Madison Road, go past the road to the hospital (Sunset Lane), past Laurel Street and turn left on Southridge Parkway. Immediately turn Right into the parking lot. The first office is Dr. Brook Chiropractic. Our office is the next one. Note: There is another Culpeper Office Park across the street which is a RED brick.